Those of you keeping a close eye on The Little Mermaid ~ Ariel’s Undersea Adventure attraction at Disney California Adventure park know that we are only weeks away from the opening. 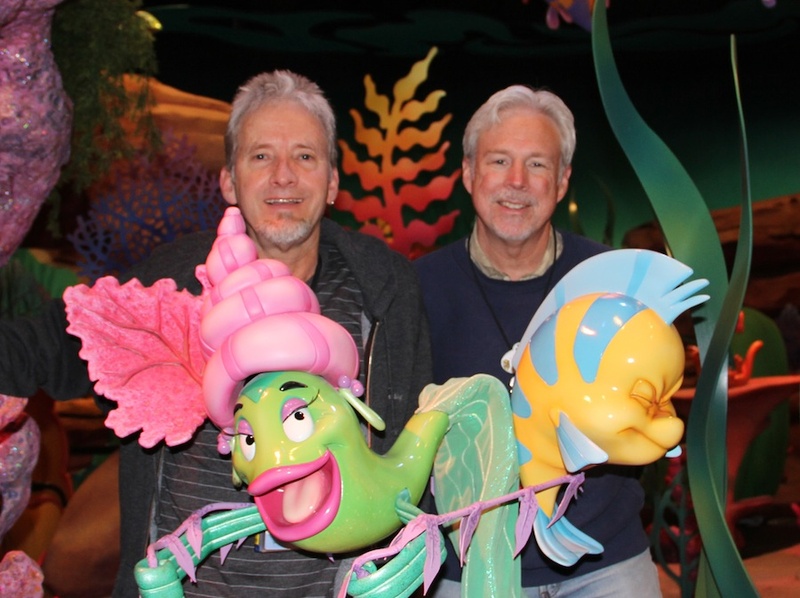 So this month, Michelle thought it was fitting to “Celebrate the Art of” Larry Nikolai and Chris Crump, who were kind enough to give her a brief moment of their time amidst their busy schedules for the Disney Parks Blog. Michelle: The newest attraction set to open at Disney California Adventure park is The Little Mermaid ~ Ariel’s Undersea Adventure. As creative director for the attraction at Walt Disney Imagineering, you played an integral role in character development for this project. Can you share a few things we should pay particular attention to while enjoying the attraction? Larry: This attraction is so full of detail that there will be lots of things to discover even after riding it several times. On one trip you might pay close attention to our Audio-Animatronic cast and on another you may get swept up in the fantastic environment recreated from the film. The colorful lighting design and the lush musical score might captivate your senses on another trip, though. It’s a very rich show! Michelle: Bringing this highly anticipated attraction to life must have been a labor of love. What was one of the biggest challenges you faced? What is one of the proudest moments that you will take away from this? Chris: My role is to help deliver the creative vision using highly advanced systems to coordinate animated figures, scenery, props – essentially all the intricate themed components and behind-the-scenes equipment. Hiding the equipment out of Guest view is a huge challenge, and our team of talented artisans and technical wizards did a great job. I have a tremendous amount of respect for all who collaborated on this project. Michelle: It must be very fulfilling to realize that your hard work and dedication put forth into this new attraction will be enjoyed by a countless number of Disneyland Resort visitors, including your family and friends. Is there someone special you look forward to experiencing a ride-through of this attraction with? Chris: Well, one person stands out – that would be my father and Disney Legend, Rolly Crump. This attraction is really a family experience (similar to “it’s a small world”) and Rolly should appreciate how we were able to have fun with this Little Mermaid story. I hope he comes away feeling that we got it right! Michelle: As we journey through this attraction for the first time, what do you hope that each of us takes away from the experience? Larry: A sense of magical wonder and the sharing of a beloved Disney classic between our Guests and their families. Chris: That you entered the world of “The Little Mermaid” – Ariel and her friends – had a good time, and left the attraction smiling. Michelle: With so many elements and features in the attraction – from music to characters and even the immersive environments – in 10 words or less, how would you describe The Little Mermaid ~ Ariel’s Undersea Adventure? Larry: It’s a music-filled extravaganza of Disney magic! Michelle: Around here we like to keep our Imagineers busy. 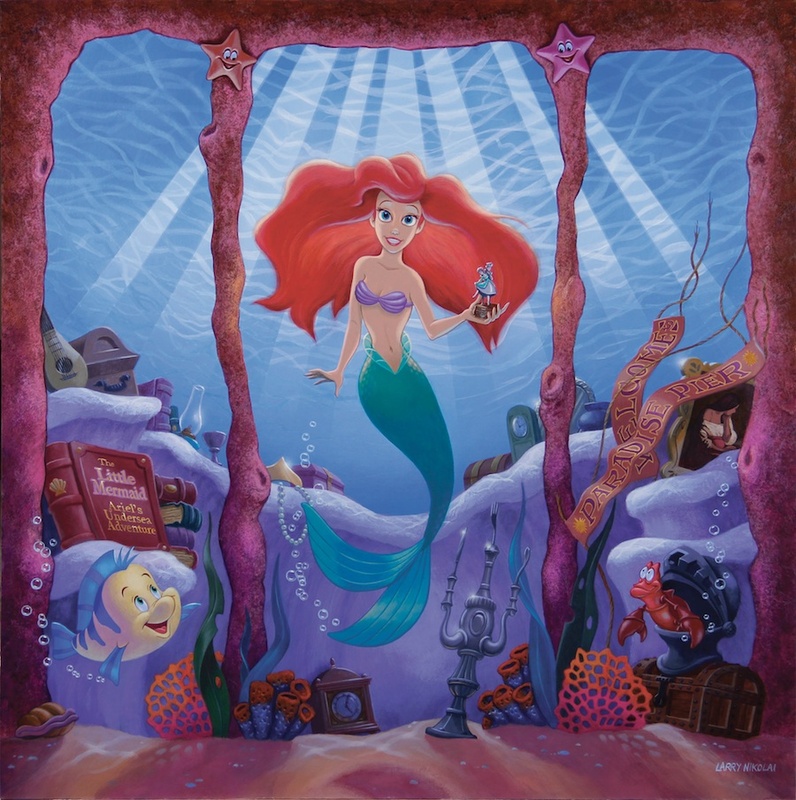 The word is you will be participating in a product release and signing on June 11 to continue the celebration of The Little Mermaid ~ Ariel’s Undersea Adventure attraction opening and have worked on some art that will debut at this event. Can you tell us a little bit about the piece? Larry: I really wanted to do a commemorative painting of Ariel that was both a portrait of her and also summed up the attraction in an allegorical way. I couldn’t cram every fish from “Under the Sea” into the composition, but her friends Flounder and Sebastian are there, along with some specific props that reference back to the attraction. Also available will be a print of the concept painting that I did a couple of years ago for the attraction’s 86-foot-long load area mural. Good things come to those who wait! Want to find out more? Visit www.ArtofDisneyParks.com for more information on the release of Larry’s “Ariel”-inspired painting scheduled to be released June 11 as part of the product debut and signing at Treasures in Paradise in Disney California Adventure park. Also scheduled to appear are artists Noah and Dave Avanzino, who will be on hand for the release of other Disney’s “The Little Mermaid” themed merchandise.